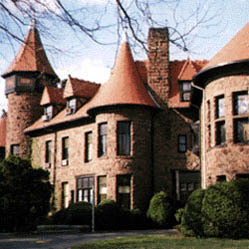 Eviswald Castle is on the campus of the former Farleigh Dickinson University (now Felecian College) in Rutherford NJ. I saw the one about a ?? castle in Rutherford and told my boyfriend here, that is where i went to college at FDU. I have a couple of pictures i do believe,, but i have just moved so it may be a while til i get them. The castle is still there as i was there this past December. I was told when i went to college there that some Erol FLynn movies were filmed there, and that there is a swimming pool in the basement. The outside of the castle is in very good condition. The street is Montross Ave,, and it is in Rutherford, NJ,, and was FDU and is now Felecian College. FDU still has its main campus in Teaneck NJ. YES - THE CASTLE EXISTS. I ATTENDED FAIRLEIGH DICKINSON UNIVERSITY AND HAD CLASSES IN THE CASTLE.THE SWIMMING POOL IS NOT IN THE BASEMENT. IT IS ON THE SECOND FLOOR - OVER THE AUTO DRIVE THRU. CLASSES WERE HELD IN THE POOL ROOM (POOL COVERED OVER WITH A FLOOR). THE ACCESS TO THIS ROOM WAS THRU THE MENS ROOM AND THE LADIES ROOM. I am currently a student at Felician College, in New Jersey. The College owns two separate campuses, one in Lodi, and one in Rutherford, where the castle stands. There is a lot of skepticism of why Farleigh Dickenson left this beautiful place abandoned with the half full cups of coffee and many other things suggesting a quick escape. They have not let anyone be admitted to the inside of the castle, except apparently for the filming of some movies to raise money. If you have any information about this castle, or about Peter Samartino, the man who brought this castle to Rutherford, I would greatly appreciate it. Thank you! I attended Fairleigh Dickinson University in Rutherford, NJ beginning in the spring of 1964 through 1968. At that time I remember Eviswald Castle as being an administrative building which included the bursor's office and student records. One could freely go to a certain file in records and look up any other students curriculum, class schedule, or home address and phone number. That was how I obtained my girlfriend's phone number the first time I called her. The rest of the castle was always somewhat of a mystery to us. I don't recall anyone ever venturing into it or discussing it all that much. It was simply there, but it lended a rather romatic mystic to the campus. Some would humorously say that it was haunted. As for Peter Samartino, the founder of the university, I remember that to us students he was regarded as a buffoon-like character who was "all business" and who loved speech-making. Upon occaision he would give a lecture about his various adventures at the required convocation class held in the gymnasium on Wednesday mornings. I can still see him emotionally ranting while students either fell asleep or secretly snuck out the gym doors when the proctors weren't looking. In 1966 he was burned in effigy at a student protest over the abscence of decent food and student amusements, like pool tables. I think that episode made the news because I saw TV cameras present. I nostalgically went back to the campus a few years ago and I was truly surprised at how little it changed. It was as though I had never left it behind. At that time it was just starting to be renovated for Felician College. And yes, that "haunted " old castle was still standing in memorial to Samartino's wonderful dream for education. He was a real "class act". I grew up and lived in Rutherford during the 60', 70' and 80'. As a child in the 60's my father arranged for me to get a small "tour" of the castle and remember that in what was then a biology class to look down a "hatch door" that was opened for me and a light switch being turned on and seeing the empty swimming pool! I went down the steps a little and saw a big (to a child) room all tiled in white with a small tile border in, I believe dark blue, around the wooden ceiling. I can't recall what floor it was on however as I was brought around and up stairs and and down again and lost my bearings. I do remember being disappointed at the entry foyer as it must have been changed since being built as it was sort of modern and not in keeping with the exterior. I did some research after that in the Rutherford library and found that supposedly a man from New York City by the name of Evison (sp) built the castle as a summer residence when Rutherford was somewhat of a resort for wealthy New Yorkers. Mr. Evison was as I recall an wealthy architect. I also remember seeing (and wish I had) an old sepia photo printed in a book of two women in long black dresses the kind with bustles and black parasols in the driveway going up to the castle. I grew up loving the castle and would ride my bike across town with a book to read on the castle property. This unique structure started out as a simple stone two-story house built for NY newspaperman and land developer Floyd W. Tomkins. It was the middle of the l9th Century and many people began to recognize this area's proximity to New York City and value it's retreat-like convenience. Tomkins acquired one lot of 14 acres of land within what was then known as Boiling Spring in Bergen County. Union Ave, one of the counties oldest roads, fronted this particular plot. Once their home was completed the Tomkins family took up residence on April 15th, 1869. Tompkins called his new home "Hill House". In 1871 Tomkins donated a portion of his remaining land to the Grace Church which located just a few hundred yards away from his house. In 1887 another New Yorker, David Brinkerhoff Ivison, (president of the American Book Company) purchased the stone house and the remaining lot from Tomkins. The existing structure and it's foundation was greatly enlarged and redesigned by architect William Henry Miller. Miller modeled much of its style after the Chateau de Chaumont situated in the Loire Valley in France. The architect used uncoursed brownstone that was obtained from a local Belleville quarry. David Ivison renamed his new home "lviswold" and occupied his castle in 1889. Then one evening in 1933, while on his girlfriend's porch, Peter Sammartino was expressing concern about the lack of educational opportunities in New Jersey. Sammartino had been terrifically enthused by his teaching experiences at Columbia University. As he gazed across the street at "the castle" he was suddenly inspired to share a dream with Sylvia Scaramelli, his future wife and partner. Together they conceived of a college with "the castle" as its heart. Nine years later and on the eve of World War II Fairleigh Dickinson Junior College held it's first classes within "the castle" walls. Ultimately Fairleigh Dickinson was to grow from its first enrolment of 153 students to the largest private university in New Jersey. Sadly, Fairleigh Dickinson University decided to close it's hometown campus in 1994 and many Rutherfordians were fearful for "the castle's" future. Much of the town had been educated and or employed by FDU and "the castle" was a powerful icon of the Borough's rich history. It was to remain locked and unoccupied for three years until 1997 when Felician College purchased the entire 10.5-acre campus and acquired "the castle." Presently, Felician College, New Jersey's leading Catholic-Franciscan college, is courageously undertaking a complete renovation of lviswold. As the college has studiously progressed through the preliminary stages of structural discovery, it is literally uncovering "the castle's" glorious past. Tearing down drop ceilings and false walls has revealed ornate walnut woodwork, Tiffany windows with portraits of swans and poets, Florentine cherubs and Italian marble fireplaces.